For 3 hours and 21 minutes, Z100/New York's Dave Foxx answers dozens & dozens of questions from radio producers and voice talents around the world. Foxx is the King of Radio Station Imaging. Here's your chance to learn from The King! If You Write, Produce and/or Voice Radio Station Imaging, This Is Your One Chance To Be "Mentored" By The Best In The Business. Here are some of the questions Dave Foxx answers in detail. As a voice artist trying to land imaging work at a radio station, to whom do I address my demos? Is it better to send a format-specific demo or a more generalized imaging demo? How do you feel about lifting copy and specific call letters when creating your first demo? Is there any particular imaging voice sound that is particularly in demand right now? What is more important: Shotgun IDs, beatmixing montages, or positioning statement IDs? When working with freelance voice talent, do most stations prefer to use ISDN or Internet? When is the best time of the year to pitch yourself to most radio stations as an imaging voice? What's the general range of pay for freelance imaging producers and/or voicers? What's the best way to learn more about EQ'ing, frequencies, etc.? I can't believe someone would still mail a PD a demo. Why not email a link to a blog or website with a demo or send it via an FTP service? What factors do you consider when choosing elements, transitions and effects in imaging? When making a music montage, what advice can you give about choosing songs from the station playlist to use? Do you consider tempo, key or feel of the song to be most or equally important? What other factors do you consider? Have you run into any old-timers who want the music to be really, really low so it won't "get in the way" of the promos? What types of "branded intros" work best? And for what types of songs should we use them: New or familiar music? Singovers vs. voiceovers? What do you think of a voice talent sending a dry read of a few sweepers as they're appearing on that radio station, as an audition? Do most stations use one or two contracted voices for imaging, or do they pick & choose from a variety of voices? Where does a voice artist find a good coach for radio imaging and a good producer for his demo? What is the secret of mastering a promo/sweeper so that it sounds LOUD ("bigger than God") when played on the radio? A friend suggested it's a mistake to "hard-compress" the promos. Yet, isn't that the sound we're after? How do you use EQ and plug ins to highlight various parts of the voiceover? Do you start with the voice and build the elements and music around it, or do you work the other way around? Or does it depend on the individual project? To help achieve a consistent sound, how much do you rely on a session template? Is it best to perfect a template to include plug ins and settings/presets for your EQ, compression and limiting that you are comfortable with and only have to make minimal changes to, or do you just include the plug ins you use regularly and set them for each project? What is the best way to get a message across? I hear what I think is way over-produced stuff on stations; the message is lost in the "stuff." How do you know when enough is enough? When it comes to the imaging of a CHR station, how do you decide if it's going to be a male or a female voice? My ex-PD insisted that ANY well-produced playful female voice is always more appealing when it comes to imaging, while my current boss prefers male voices for "authority." Which factor weighs more: "seductiveness" or "authority" when it comes to the image of a CHR station…and why? Which is best for promos and sweepers: production music or the music the station actually plays? How can we convince radio stations not to renew with their existing talent and give some of us talented newbies a shot? What is your opinion of online services that promise to coach us and/or get us station imaging work? Many stations are automated and some of these systems have their own production hardware/software. This can impact your ability to produce solid promos. In today's cost cutting environment, is there a turnkey system you recommend in a production studio setup? I don't mix audio formats. I stick to a common .wav format with like sample rates throughout the system. Some people try to mix mp3 files with .wav files, and there are quality control issues. What are your thoughts on that? Most of the scripts I produce are written by others (PD's and APD's). There are times when I don't necessarily agree the finished product is the best it could be despite the writer being happy with the end result. Do you have any advice on increasing my influence over the end result while maintaining respect for their positions and directives? As a producer, I find there's never enough time to get all the work done. How do YOU do it? How much notice do you take of your direct competition and their imaging? Am I correct in thinking it's better to stay 100% true to the format and style of the station I'm working on rather than to consider what the opposition may be doing? Having been at the top of your game for so long, how do you keep it interesting? Are there things you use to challenge yourself to develop further? How do you stay motivated in a field where it's common to get "burnt out" by workload and repetition? And here are some of the additional nuggets that came out during the freewheeling Q&A. 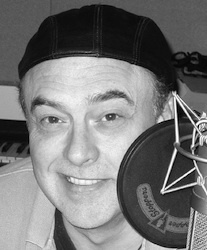 Dave Foxx has won dozens of production awards, produced a platinum record, and is “the voice guy” for dozens of radio stations from Bakersfield and New York to Tokyo and Paris. Click the button below to add the EVERYTHING YOU NEED TO KNOW ABOUT RADIO IMAGING Dave Foxx to your wish list.